The time has come! As you proceed to the interview venue, you want to stand out from the rest of the candidates. You want to make sure that you are well prepared to face any HR questions. Finding a job is not an easy task due to loads of competition. Here's a list of HR questions which can get you prepared before an HR interview. Sounds great, right? Well that’s what this article is all about, having said that, find below the most common questions asked by HR during interviews and how you should approach them confidently. After you have applied from one of the best job portal websites, you have landed into an interview. I am sure you don’t want to waste this job opportunity. To be a successful candidate, you must be confident, calm and well prepared to face any type of questions by the interviewer. Avoid stress, nervousness and be professional even if it’s your first interview. Every interview is unique and every HR personnel might ask you different set of questions. That being said, there are some common questions which every jobseeker should prepare. Whether its your first interview or you are a professional. How much is your work experience? What other similar jobs and skills you have worked? Do you have any additional skills? What occasion has had the greatest effect on your life? We saw you have resigned in a short notice, why? We saw you have worked in the previous company for less time, why? How much you rate yourself for the job? What might you say was the greatest day or experience you at any point had? What might you want to enhance about yourself? Why are you leaving your current organization? How good are you in taking independent decisions? Have you ever faced a situation where you took a decision independently? Recruiters are impressed by the candidates who are well prepared for the interview. Thus doing some research is also important. Before you go for the interview, it is also important to know where are you going and what you getting into? Research about the company where you have applied for the job opening. Prepare a good resume with specific information in regards to the job opening. Keep extra copies of all the relevant documents which you might need. Read the job description and job specifications well. Google the job and its requirements to be prepared for any other questions. Sleep well before the interview day, this will keep you fresh. Dress well and in neat in western formals. Reach the interview place at least 15 minutes before time, this will give you time to calm yourself. Listen to the questions well before answering. Don’t over reach or over answer. Only answer what you are being asked. Maintain a good body language. Smell good. Use a good perfume or a deodorant, just don’t sweat. Stay confident, be honest to yourself. Its time to show the interviewer that you are well prepared and ready to get hired. If you will follow all the above mentioned pointers, I am sure that you are going to nail the interview and get hired. 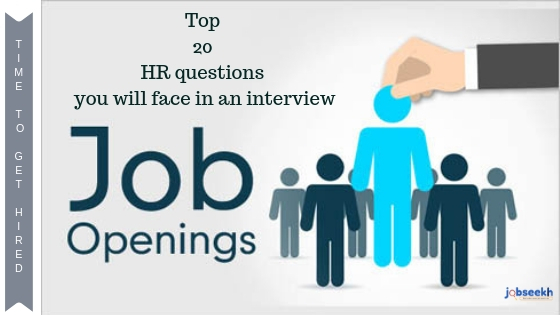 For more information about HR interview Questions, career development tips, please visit https://jobseekh.com. Tags: Interview questions for HR position, Most common questions asked by HR during screening interviews, Final interview with HR manager, Interview questions for HR position for freshers, HR interview questions and answers for experienced candidates free pdf, HR interview questions.